Critical Incidents are those events that have the power to overwhelm our usually effective coping skills. 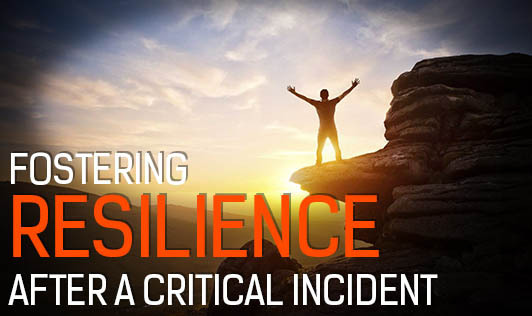 Surviving natural disasters such as hurricanes or man-made disasters such as acts of terrorism and criminal acts can be devastating and leave us feeling helpless, and disorientated. A sudden loss or an event creating unexpected lifestyle changes, like a layoff or the death of a loved one, can equally be impactful. If in our experience with these types of events, our interpretations were ones where we felt threatened, or those who are significant to us did, we are likely to have a normal , but strong stress response, one where our physiological survival skills are heightened in order to achieve safety from the threat. Afterwards, the release of such powerful stress hormones may contribute to experiencing physical, emotional, psychological, and behavioral reactions. Our reactions to such events are normal and with time generally begin to fade away. For most of us, these stress reactions will not be as strong, but we may face difficulties in our journey to recovery. If your interpretation of the event was life threatening, know that the reactions listed in the table below are normal and can be the after-effects of such a powerful stress response. Using the tips given below that foster resiliency will aid in your return to a state of well-being. Trust in your abilities to bounce back. Care for overall wellbeing by taking care of your diet, exercise, and rest. If you are on medication, continue your prescriptions and schedule an appointment with your doctor. Seek out comfortable, familiar surroundings that promote a sense of safety. Share your experience and thoughts with people who are supportive and optimistic. It helps to talk or write about your thoughts and feelings. Work on beginning to accept what has happened. Give yourself time to rebound. It is not a good time to make a life changing decision. Set a forward thinking positive goal for yourself and/or your family member(s). Return to or create daily routines for yourself and your family. If you are spiritual, seek guidance. Find your sense of humor. It is helpful to laugh especially during challenging times. It is normal that your body responds to sensory triggers. Sights, sounds, and smells may stir memories and reactions. Renew or recommit to your purpose in life. Consider consultation from a professional counselor if you feel stuck. Commit to succeed! So many do!